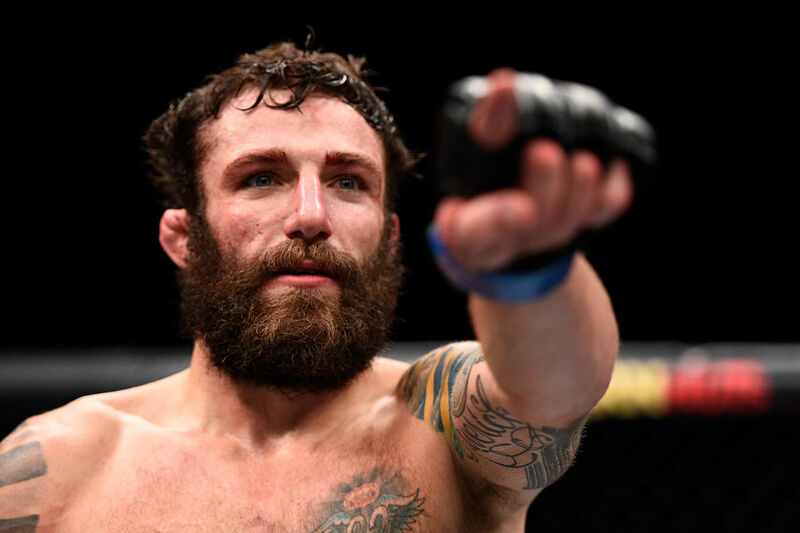 Michael Chiesa celebrates his win over Jim Miller on December 10, 2015 in Las Vegas, NV. (Photo by Jeff Bottari/Zuffa LLC)" align="center" /> They can rebuild him. Okay, it’s not as dramatic as Steve Austin becoming the Six Million Dollar Man, but Michael Chiesa does feel a lot different heading into his UFC 223 bout against Anthony Pettis than he did for his last one against Kevin Lee, or for any previous bout for that matter. So where did this rebuilding of the “Maverick” motor take place? It wasn’t a cross-country trip from Spokane. Instead, he went south to Las Vegas, putting in a full camp at the UFC Performance Institute and with the Syndicate MMA squad. So with all the high-tech toys that measure everything to do with an athlete’s performance and take everything to a scientific level, has Chiesa lost that raw edge that endeared him to fight fans ever since he won season 15 of The Ultimate Fighter?? But would this have happened had he not lost his last bout to Kevin Lee in June of last year? And as he gets ready for a main card bout against a former world champion on one of the biggest cards of the year, it’s clear that the No. 9-ranked lightweight hasn’t lost any luster after his submission defeat to Lee, one marked by controversy after referee Mario Yamasaki halted the bout without a tap from Chiesa. Is it better to lose like that, where there are some question marks, or to lose with no doubts as to who was the better fighter that night? “In this sport, you want things to be left without question,” said Chiesa. “And with that fight and the way everything transpired as it ended, I’d rather just get beat fair and square. There are things to take away from that fight – I need to stop giving up my back in the first round, that’s a bad tendency I have in a lot of my fights, and there are habits that need to be broken. But when you have controversy like that, there are always these ‘what ifs’ swirling around. Where if you get beat fair and square, you hit the drawing board, you get back on the horse and get back after it. Good move, as Kevin Lee won’t be in the Octagon on Saturday night. Pettis will, and despite a recent skid by “Showtime” that has seen him go 2-5 in his last seven, the stage is set for a stylistically pleasing battle with Fight of the Night potential. Chiesa believes that alone is a reason for the promotion to have this bout on the Pay-Per-View portion of the card. Hearing Chiesa talk like this, it’s clear that in spite of the loss to Lee and his new camp in Vegas, he hasn’t lost his fighting edge, and that mentality is what’s going to take him as far as he wants to go at 155 pounds. And he wants to go pretty far. So Maverick is still there?